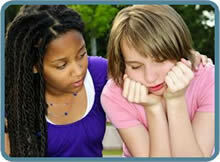 Home » Your Questions: Teens » Is there some way I can stop my pregnant friend from having an abortion? Is there some way I can stop my pregnant friend from having an abortion? The only one who can ultimately save a baby from abortion is the mother of that baby. Many states have parental consent laws. But even then, a woman under age 18 can circumvent parental consent. In Wisconsin, a woman who is legally married can have an abortion without her husband’s knowledge or consent. Believe their baby is threatening their survival. Feel they’ve lost control over their life as they know it. Consider abortion as their only choice. Feel abortion is a choice they don’t want to make, but must make. If you want to try to intervene to save the life of the baby, you had best put the baby on the side for now, and reach out to the woman – not as a manipulation, not as a strategy, but in sincere recognition that she is the one who has serious concerns that must be addressed. She has experienced enough rejection in her life – she doesn’t need yours as well. The baby is not the problem – the baby is safe for now. It is the woman who is in crisis. Before talking with her, you will need to educate yourself about fetal development (especially the week of growth her baby has reached), abortion procedures, and possible complications. This information can be found on this website. Ask her permission to talk with her. Be prepared to go on her agenda. Listen to your friend’s concerns and fears without judgment. Let her tell you her story – her whole story. She may start just prior to her pregnancy, but her story really begins a long time before that. She has walked a long way before reaching the abortionist’s door. Find out how she got there. Listen to her. If something is unclear or confusing, ask her to explain it. Probe as you listen. If she gives you a “blanket statement,” ask her to give you an example or to be more specific. Repeat what she’s said from time to time so that she knows that you are really hearing her. Later in the conversation, when an opportunity arises, tell her that you’ve learned what her baby is like at this time in her pregnancy. Many women want to believe that their baby is insignificant at this point – not really a baby yet. Gently ask for her permission to share this information with her. Hearing this will be very hard for her. If your friend is able to acknowledge her baby is real and living and growing, abortion will become a much more difficult option for her. That’s why she is working so hard to block the truth. Ask if she’ll let you tell her what you’ve learned about abortion. Warn her of all the potential harm to her. There are emotional and spiritual consequences women suffer as well as physical ones. Let her know that you are sharing this information because you are trying to spare her years of pain and suffering. She has a right to know all the facts before making such an important decision – a decision that will last her lifetime. Finally, let her know that if she changes her mind at the last minute, she can leave the abortion clinic at any point prior to the insertion of the suction cannula. Even if she’s had pain medication injected or laminaria inserted, she can leave The laminaria can be removed by a different physician (as soon as possible.) If she swallowed the abortion pill, its effects are often able to be reversed if she sees a doctor as soon as possible.